A report is only useful if those who receive it understand what it means. Knowing how to use Crystal Reports gives you the edge in producing reports from your database that really are crystal clear. Crystal Reports 2008 For Dummies is a quick and easy guide to get you going with the latest version of this bestselling report-writing software. A report is only useful if those who receive it understand what it means. Knowing how to use Crystal Reports gives you the edge in producing reports from your database that really are crystal clear. Crystal Reports 2008 For Dummies is a quick and easy guide to get you going with the latest version of this bestselling report-writing software. In fact, it's so popular that previous editions have made it a bestseller too. Crystal Reports 2008 For Dummies gives you just what you should know to produce the reports you'll need most often, including how to: Pull specific information from your database, sort and group it, and find the details you need Use dynamic or cascading prompts Troubleshoot and print reports and save time with templates View reports on your LAN Write formulas to retrieve specific information Create and update OLAP reports Format reports, control page breaks, and even add graphics or Flash files Enhance your reports with charts and maps Use Crystal Reports in the enterprise There's also a companion Web site with sample reports from the book and links to sites with more related information. 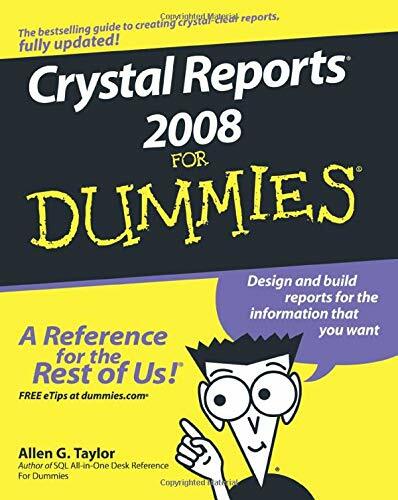 With Crystal Reports 2008 For Dummies by your side, you'll soon be able to create reports from simple to spectacular, whenever the need arises.